Allows you to carry out businesses without the barriers of time or distance. The ability to launch marketing campaign via emails. Allows your customer to 'tell a friend' about your business & products. Allows your customers to self-service, participate and find useful information in forums & blogs. Attractive and presentable product description via multiple images, video clips alongside of text. Built-in Content Management System which allows you to manage and update your web site content. Supports gift cards; reward points system; discount coupon code either by percentage or fixed amount. Best sellers and Popular searches. 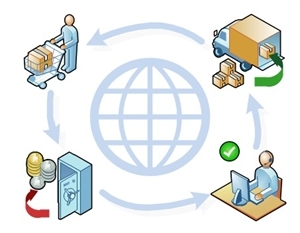 Supports multiple warehouses with inventory tracking capability. Supports both online and offline payment methods. Live chat, SMS txt message, Quickbooks integration. Allow customer to register/login by email or by username. Password recovery via email is provided. ~ Configurable customer attributes (such as «Date of birth», «Phone number»). ~ Supports multiple billing and shipping addresses per customer. Allow customer to buy your products via shopping cart. ~ Supports offline payment; manual or online credit card payment. ~ Configurable checkout attributes (such as «Gift Wrap» or «Enter custom message»). ~ Allow One-page and Anonymous checkout. ~ Configurable shipping cost calculation. ~ A button click of packing slip printing. ~ Support of shipping tracking number. ~ Allow customer to view order status and history. ~ Allow customer to enter product price (if enabled). ~ Supports volume discounts (Tier prices). ~ Allow customers to be grouped by roles, as a result you can assign different product pricing based on group. ~ Allow customer to select viewing price either GST inclusive or exclusive. ~ Allow store owner to hide prices for non-registered customers. ~ Customer can search products and view by featured products, sale products or new products. ~ Compare products feature (if enabled). ~ Customer can build and purchase "kit product" (if configured). ~ Display product stock availability option. ~ Customisable order notification emails. ~ Customer product reviews feature. ~ "Email a friend", "Share" (on Facebook, Twitter....), News and recently added products RSS feed features. ~ Contact us form to allow customers send enquiry to you via email. ~ Built-in reward points system. ~ Store news & polls supported. ~ Live chat feature (if enabled). ~ Multilingual and Multicurrency with real time currency exchange rates support. Supports categories and manufacturers. Categories can also be fully nested to any level desired (sub-categories). Products can be mapped to more than one category or manufacturer. ~ Supports structured product specifications (e.g. processor, memory, graphic card). Configurable product attributes (e.g. colour, size). ~ Stock management by product attributes (such as, colour and size). ~ Inventory tracking and reporting. ~ Supports multiple images per product. Auto image resizing. License file can be attached. Configurable download activation type: 'When order payment status is Paid' or 'Manual activation'. ~ Support for simple product or product with variants. ~ Supports Gift Cards (Virtual and Physical). ~ Supports weight and size measurement dimensions. ~ The flexibility of disabling buy buttons for specific products. Access control list which means you can assign store admin functions based on roles. ~ Database backup & restore function. ~ Import/Export XML or Excel files. Page execution time is 0.0048542000.